Of course the first I start with is an easy one as it's my local; it's a pub I've been going to on a regular basis ever since I was first legally old enough to drink alcohol, and now it's my local being a 2 minute walk from my house. The Fat Cat is a pub that every fan of real ale has heard of, from Penzance to Dundee, and indeed I've met people from outside of the UK that has heard of it's legendary status. The Fat Cat is located on a street corner just off of Dereham Road in Norwich, on the corner of Nelson and West End Street. It's easily a 15 minute walk from the city centre. It's a fairly spacious pub with tables on the street outside, and plenty of seating inside including a back room which they open on busy evenings as long as it's not hired out for a private event. Everywhere you look, the pub is covered in vintage breweriana and advertising from Black Cat Cigarettes, original Bullards windows that are still intact, and old Adnams signage. Looking up at the ceiling you'll see tons of old serving jugs and tankards hanging there. 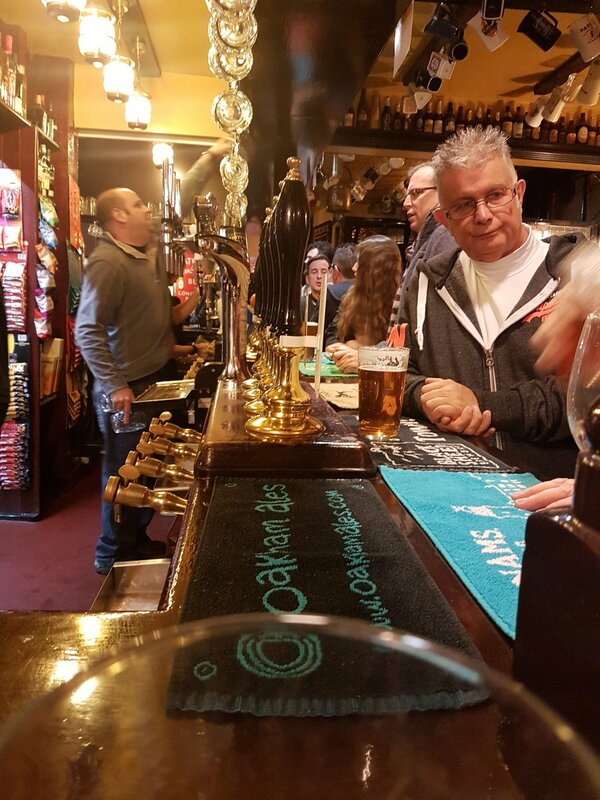 It is primarily a traditional real ale pub so on the bar you'll find 12 hand pumps, along with another 15 beers served from gravity. The Fat Cat owns its own brewery so you'll usually see at least four of theirs on the pumps which start at a reasonable £3ish a pint for their Best Bitter (oh I remember when it was £1.80 and I'm sure some people remember when it was even cheaper). They always have a good selection of almost every style you can think of on cask, so there really is something for everyone. Usually you'll find Oakham Green Devil, something else local from Adnams or Lacons, and treats from further afield like Dark Star or Marble. If you're lucky they'll be serving Bass on gravity. Moving on to the keg taps, they have 6 taps that always serve Belgian fruit beers, a standalone ornate Erdinger fount, a group four lagers/ciders which delightfully serves Budvar and 4 taps dedicated to craft keg. Usually a good mix too, but nothing too crazy or expensive and usually contains something from Marble, so I'm happy. There's not much in the bottled selection anymore, a few Belgians and Sam Smiths but when there's so much choice on draught that's not an issue. They also have a large selection of real ciders, a small selection of wines and some spirits for those not into beer. Soft drinks come in the form of cans of coke, and a selection of more interesting canned soft drinks. Good luck if you're hoping to get a decent meal here because you have three options for food, just as an old fashioned pub does: Crisps, mighty pork pies and, if you're lucky, hand made cling film wrapped rolls which run out VERY quickly. You don't really get events at the Fat Cat because it is what it is... just a pub. Although they'll usually do something like dedicate a certain amount of pumps to a certain brewery to coincide with Norwich Beer Festival, like recently they had Timothy Taylor Week. You'll be hard pressed to find a time when it isn't busy, and when you don't struggle to find a seat which is usually the mark of a good pub. In the summer, you'll see people lined up on the curbside outside, hoping their pint glass doesn't slide off the window ledge, then diving for a bench the moment it looks like a group is moving on. It was relatively quiet for a Friday night and we managed to get a seat without any hassle. We noticed that they'd decided to get in on the trendy mulled cider game, which Sammie indulged in, whereas I had my standard couple of pints of Oakham Green Devil which was a very nice drink and went down well. All in all, the Fat Cat really is a must visit pub for anyone coming to the area.